This Raspberry Pi 2 with computer vision and two solenoid “fingers” was getting absurdly high scores on a mobile game as of late 2015, but only recently has [Kristian] finished fleshing the project out with detailed documentation. Developed for a course in image analysis and computer vision, this project wasn’t really about cheating at a mobile game. It wasn’t even about a robotic interface to a smartphone screen; it was a platform for developing and demonstrating the image analysis theory he was learning, and the computer vision portion is no hack job. OpenCV was used as a foundation for accessing the camera, but none of the built-in filters are used. All of the image analysis is implemented from scratch. The game is a simple. Humans and zombies move downward in two columns. Zombies (green) should get a screen tap but not humans. The Raspberry Pi camera takes pictures of the smartphone’s screen, to which a HSV filter is applied to filter out everything except green objects (zombies). That alone would be enough to get you some basic results, but not nearly good enough to be truly reliable and repeatable. Therefore, after picking out the green objects comes a whole chain of additional filtering. The details of that are covered on [Kristian]’s blog post, but the final report for the project (PDF) is where the real detail is. If you’re interested mainly in seeing a machine pound out flawless victories, the video below shows everything running smoothly. The pounding sounds make it seem like the screen is taking a lot of abuse, but [Kristian] mentions that’s actually noise from the solenoids and not a product of them battling the touchscreen. This setup can be easily adapted to test out apps on different models of phones — something that has historically cost quite a bit of dough. [Ben Krasnow’s] latest project will be good for anyone who wants a complicated way to cheat on a test. He’s managed to squeeze a tiny FM radio receiver into a ballpoint pen. He also built his own bone conduction microphone to make covert listening possible. The FM radio receiver is nothing too special. It’s just an off the shelf receiver that is small enough to fit into a fatter pen. The real trick is to figure out a way to listen to the radio in a way that others won’t notice. That’s where the bone conduction microphone comes in. A normal speaker will vibrate, changing the air pressure around us. When those changes reach our ear drums, we hear sound. A bone conduction mic takes another approach. This type of microphone must be pressed up against a bone in your skull, in this case the teeth. The speaker then vibrates against the jaw and radiates up to the cochlea in the ear. The result is a speaker that is extremely quiet unless it is pressed against your face. 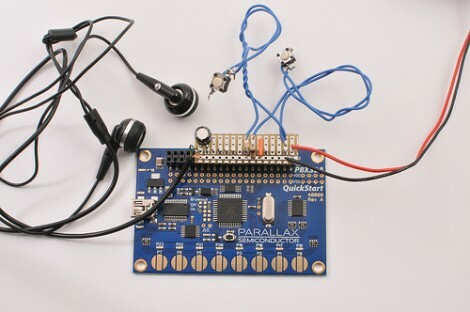 Building the bone conduction mic was pretty simple. [Ben] started with a typical disk-shaped piezoelectric transducer. These devices expand and contract when an alternating current is passed through them at a high enough voltage. He cut the disk into a rectangular shape so that it would fit inside of the clicker on the ballpoint pen. He then encased it in a cylinder of epoxy.